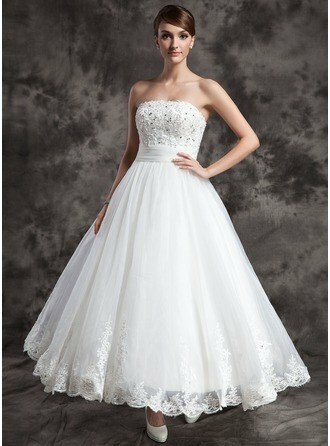 Wedding Dress Types - What Style Should I Choose for My Wedding? >> Wedding Dress Types – What Style Should I Choose for My Wedding? 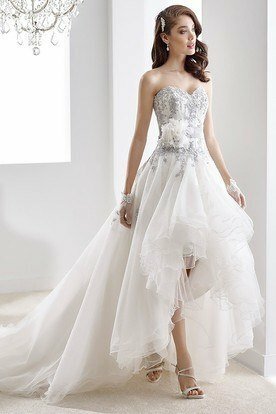 Wedding Dress Types – What Style Should I Choose for My Wedding? When you’re choosing your wedding gown or dress, you want to be sure you’re picking the right one for your body shape. While you might love the mermaid or sheath style, if you’re shaped like an apple, it won’t be a flattering silhouette. Nothing says you can’t wear whatever you like, but if you’re looking for flattering shapes, we’ve got you covered here. First, let’s start with the silhouette itself. 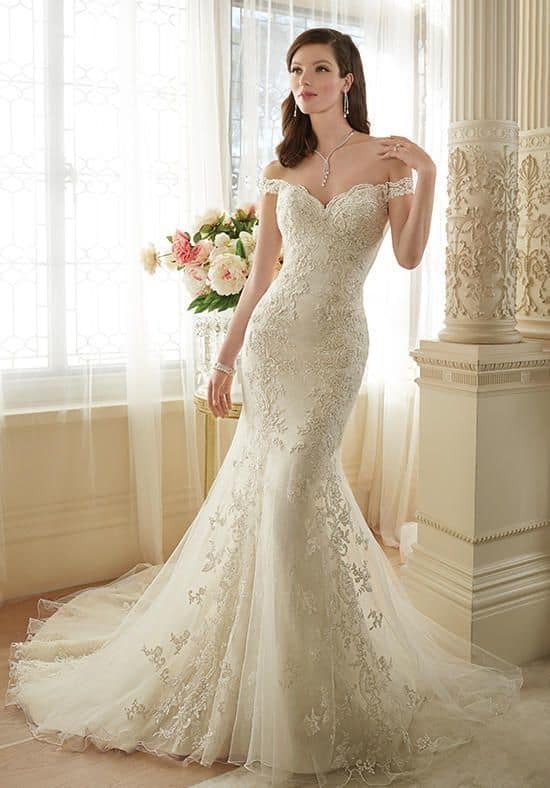 This is the type of dress you’ll choose without all the details that make it unique and special. The A-line dress is perfect for every body shape. It’s flattering for pears as well as apple shapes. Even those who are more of a rectangle will find that the A-line is a fantastic way to show off your assets while minimizing problem areas. The bodice of the dress is fitted with a dress that flows from the top area without a cinched waist. It’s shaped like an uppercase letter A from the bodice. The mermaid shape is skin tight from the bodice to the knee then flares out until it hits the floor. If you imagine what a mermaid looks like with skin-tight scales down to the fins, that’s what the mermaid shape of the dress is. The mermaid and the trumpet below are flattering for women who are triangle or hourglass shaped. This style is often confused with the mermaid because they resemble each other. The top of the trumpet dress is tight, but the dress starts to flare closer to the hips and thighs than the knees like the mermaid. Imagine the mouth of a trumpet and how it tapers gradually. That’s the style of the trumpet dress. A sheath dress is one that skims very close to the body from the bodice straight to the floor. It’s often called a column dress since there’s no real cinching of the waist for this style. The sheath dress looks great on women who have an hourglass or rectangle shape to their figure. Most everyone understands a ballgown. It’s what Cinderella wore to the ball. It’s fitted at the top and has a cinched waist that flares into a full skirt. It’s often worn with a petticoat to get more volume on the bottom. The ballgown is not great for those who have a more rounded shape to their body, but otherwise, it’s one dress that’s flattering on most shapes. The empire dress is great for every single silhouette imaginable. It’s cinched under the bust and flares slightly to skim the body beautifully. Between this shape and the A-line, there isn’t a woman that won’t look terrific in one of these dresses or gowns on her wedding day. The length of sleeve for your wedding dress can vary between short, cap sleeves to long sleeves down to the wrist. Depending on the style of dress and the neckline, any of these styles will be good for your wedding day. The more important question is the style, and how it will look with the dress you want. Juliette sleeves are cap sleeves with a small puff at the shoulder that transition to a long sleeve to the wrist. Puff sleeves are cute little sleeves that are fitted around the top of the arm. Butterfly sleeves are loose and flowing sleeves that are short. Bell sleeves are long sleeves that are flared, loose and flowing. Bishop sleeves are loose and flowing to the wrist too, but they are cuffed at the wrist. Poet sleeves are fitted long sleeves that start to flare between the elbow and the wrist. Set-in sleeves are ones that are part of the bodice. They often don’t have seams. Raglan sleeves are an angled seam short sleeve that are common in sports tops, but not as common in wedding dresses. Tulip sleeves are a short sleeve that has material that crosses each other to create the look of a tulip petal. Sleeveless bodices are ones that do not have straps to hold it up. The dress usually has a built-in bra, but might need extra support. Spaghetti strap tops have no sleeves with only a thin piece of material holding the bodice. Sometimes, they might be clear to give the illusion of strapless. Let’s start with the shortest style of wedding dress. 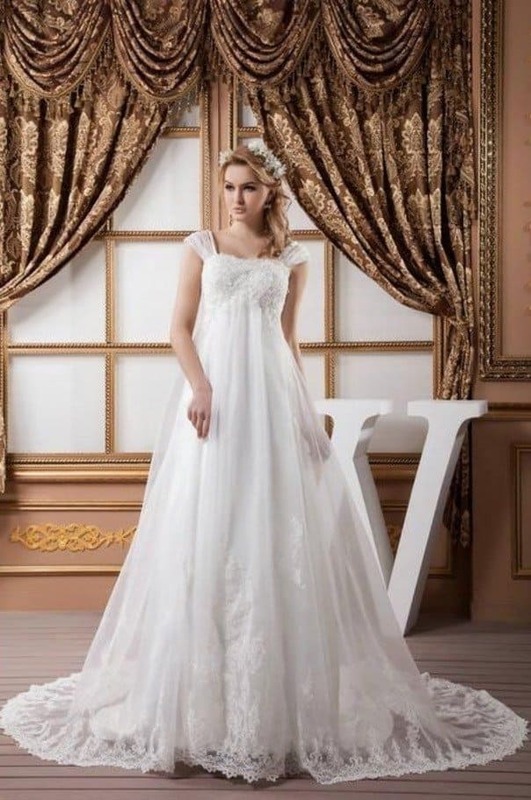 The knee-length wedding dress is not usually fitted, since that would give the bride a mini-skirt as wedding attire, but that might be the preference of some women. The knee-length is fun, flirty and skims around the knees. This type of dress length hits a bit below the knee. It’s a flattering shape that is used in some A-line dresses. It’s a good choice for casual weddings like rustic barn weddings or backyard nuptials. At just above the ankle, these dresses can be fun and casual or more elegant and formal depending on the style of the dress. They’re good for beach weddings where the bride might want to be barefoot. An ankle-length gown can show off a stunning pair of shoes, or be perfect for the bride that wants to go without shoes at her beach destination wedding. She won’t have to worry about pulling her dress off the ground while walking outdoors, either. The floor-length bridal gown will skim the ground while sometimes having extra material in the back to follow behind the bride as she walks. This is traditionally what many women choose for their wedding day. While this is a slightly trendy look now, it’s one that is pretty stunning for most dresses. It’s a bit unusual, too. The hi-lo dress hits about knee length or below in the front and around the ankles or lower in the back. This type of train is also called the brush since it barely touches the ground in the back. It’s great for a casual wedding dress that the bride won’t have to worry about dragging behind her outdoors. A panel train is added as a separate panel to the dress. It’s usually added to the waist, so it falls behind the dress as part of it. The court is a type of train that flows directly from the waist as opposed to the sweep, which comes from the hem of the gown. 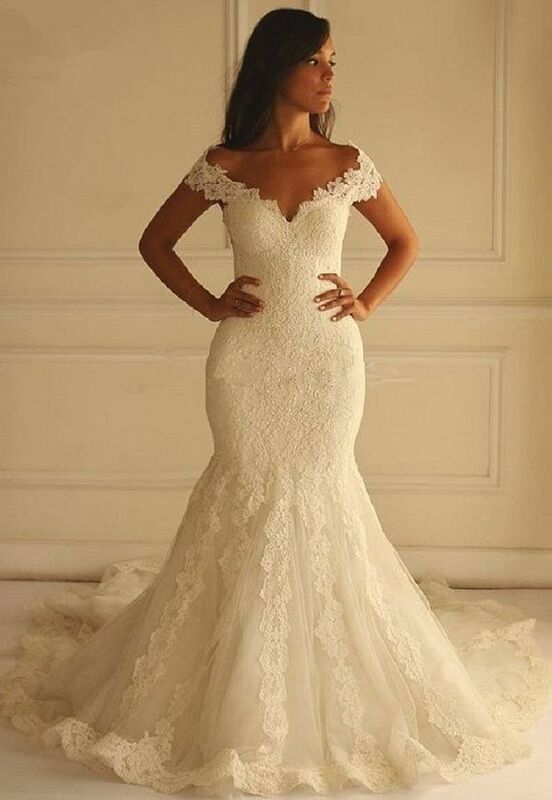 This kind of train alters the silhouette of the dress, so make sure you’re seeing it from every angle before you buy the dress. This type of train is worn from the shoulders of the dress to the floor in a separate panel. It’s a rare kind of train that isn’t used much on traditional dresses. The chapel train extends approximately 3 to 4 feet behind the bride from the waist. It’s a dramatic train that is seen on most dresses. This is a dramatic train that often needs another person to carry it down the aisle. It’s between 6 and 7 feet long. This train is over 12 feet long and worn by royalty and celebrities often as part of their ceremony. It requires more than one person to help carry the train and spread it beautifully around the altar when the bride gets to the end. Bridal veils come in a variety of lengths, and there are a few considerations for the veil itself. First, you’ll need to consider the style of your hair to ensure that the veil you pick will be complementary. Second, you’ll have to think about the length of the veil and whether you want it to be simple or elaborate. The length of the veil will matter with the style of your dress, too. 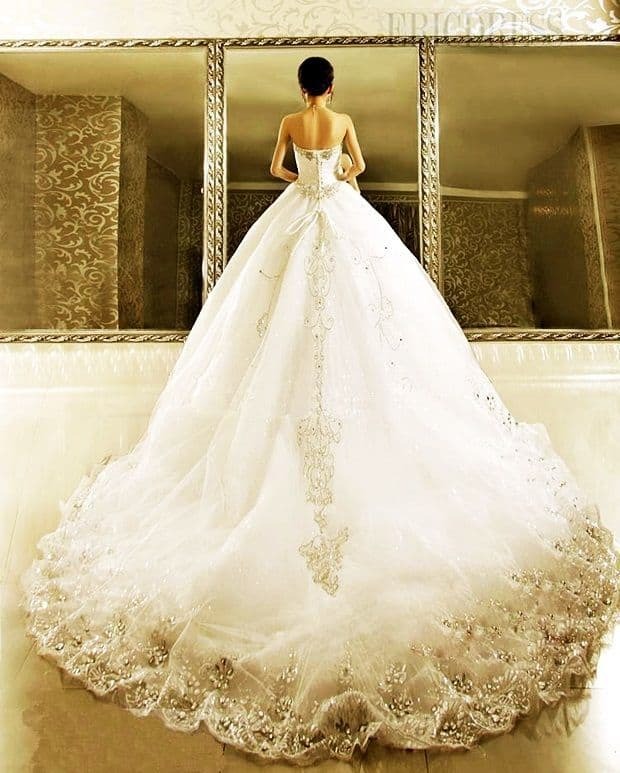 You might decide to be dramatic with a short dress and long veil, which will be surprising for your groom and guests. 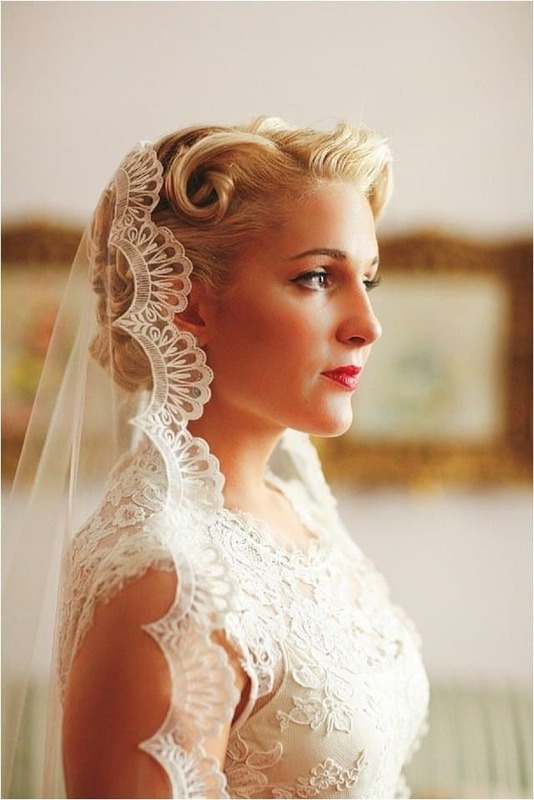 The mantilla is a traditional Spanish style veil that has edges of scalloped lace around the edges. The middle can be tulle or lace itself. If you have ever wanted your groom to lift your veil as he is set to kiss the bride, this is the kind of veil you’ll want to get. It has a front piece that can be folded back away from the face at the right moment. A bit of lace or tulle tied around the head is a trend that is seeing a celebrity boost. It’s a lovely way to buck the normal trends of wedding veils for your nuptials. Instead of a veil, the Juliet cap is a crocheted piece of fabric that is laid on the hair. It’s usually made with elaborate beading and jewels. The blusher veil is another name for the piece of fabric that is used to cover the bride’s face as she walks down the aisle. It might or might not include another piece of fabric at the back. 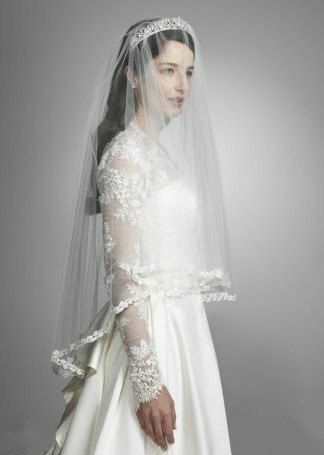 The Birdcage veil is an offset blusher veil that might only come over the forehead or cover part of the face. It’s often part of a tiny hat or other accessory. A short veil might only cover your hair. It would be more of a hair accessory than a bridal accessory. It can still cover parts of the face with drama and style. A bride who wants to keep herself free to dance the night away can choose a veil that hits around her shoulders. It’s perfect for a variety of hairstyles, too. It won’t become a burden during the wedding or the reception. 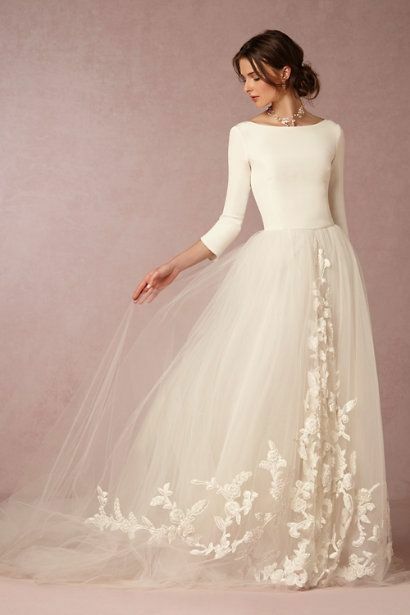 An elbow veil will skim around the upper part of your body beautifully. 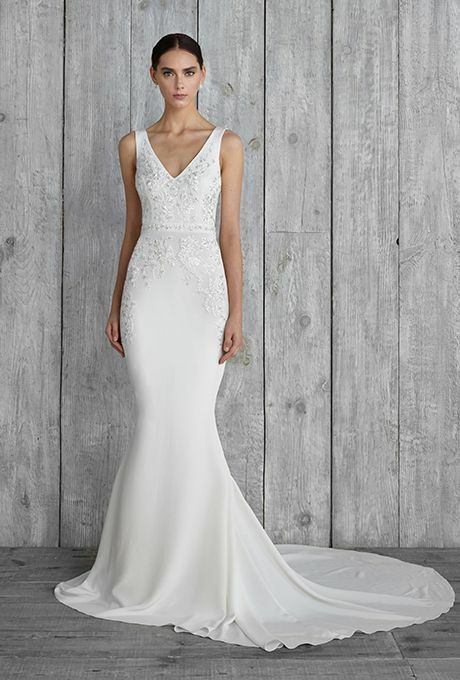 It’s important that you choose a style that will complement the dress since this kind can swirl around the bodice continuously and hide detail. This veil length hits around the fingertips, which gives it the name. It’s a perfect length for those brides who want some drama without giving them a veil that will get in the way. The length of this veil falls between the knee and the ankle depending on the bride’s choice when picking out her dress. It’s great for tea-length or ballerina bridal gowns. It’s also perfect for the bride who doesn’t want to worry about her veil while she’s dancing. The chapel reaches the floor but doesn’t require anyone to carry it or arrange it while you’re at the altar. 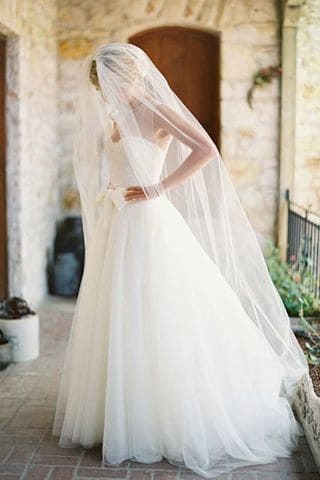 The length of this veil will often float dramatically behind the dress. It’s approximately 120 inches from the top of the veil to the end. Like the cathedral dress mention above, it’s meant to be held by someone in the wedding party. This is another length that has the same name as the dress length. The royal veil reaches over 120 inches. You might want the dress or the veil to be longer, or you can have the same size. Stick with the same color veil as your wedding dress. If you have an elaborate dress, pick a simple veil and vice versa. It’ll be more elegant. Think about how you want to look in your pictures. Consider if you’ll want to fight with the veil all night. You might decide on two veils; one for the ceremony and one for the reception. Pick a hairstyle before the veil. Ask yourself whether you’ll have hair accessories, too. Some veils work well with certain accessories and others do not. There’s much to think about when choosing a dress, but the veil is just as vital to the entire bridal look. 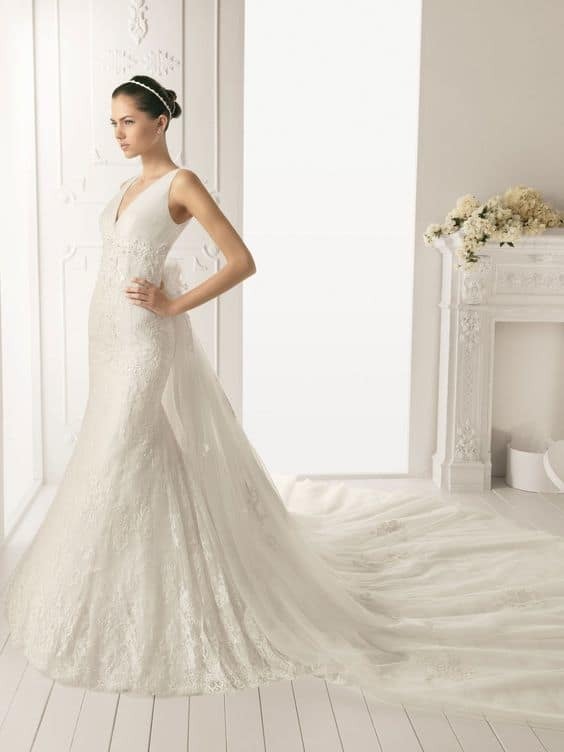 You don’t want to pick a stunning dress and end up with a veil that doesn’t do it justice. 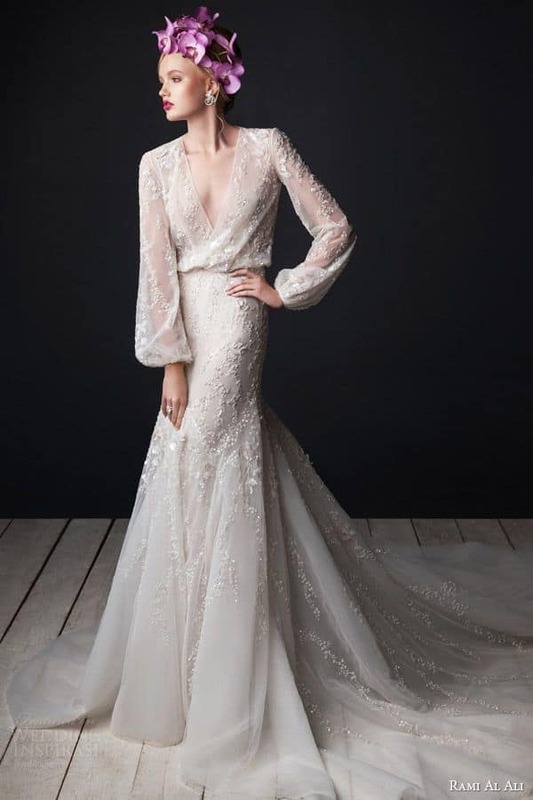 The veil should never be an afterthought, which is how it can look when you don’t plan on the color and style while you’re shopping for a dress and deciding on your hairstyle. That pretty much covers the types and styles of wedding dresses and gowns that you could potentially pick for your wedding. While you should try to stick with the silhouette that works for your body shape, it’s your big day, and you should wear what makes you feel like a princess.